(Article By Ross Z. Bonar) – The second edition of the TMB Leaderboard for 2012 is out following the last weekend of competition in first quarter! Based on all of the information gathered through the TMB Results Tracker, we are able to statistically see who the top performing drivers have been so far in 2012. A total of 201 drivers have competed in monster truck events this year with an incredible 137 different drivers scoring a competition win. The Grave Digger team celebrated their 30th Anniversary in style during 1st Quarter as Dennis Anderson, Pablo Huffaker and Gary Porter combined to lead 6 of our 9 statistical categories on the TMB Leaderboard. 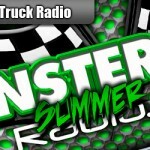 Great job to all of the drivers on their outstanding performances thus far in 2012. Stay tuned to the TMB Results Tracker to find out what went down at events all around the country and watch for another Leaderboard update later this season! 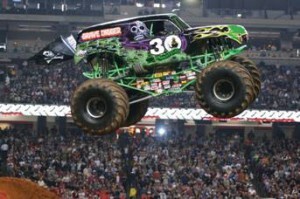 (Aurora, Illinois – Feld Motorsports PR) – Feld Motor Sports® is honoring the 30th anniversary of Grave Digger® in 2012 with a year-long celebration that Advance Auto Parts Monster Jam® fans will not want to miss. The entire Grave Digger race team, including creator Dennis Anderson, will be commemorating the 30 year history as the most celebrated Monster Jam monster truck of all time. 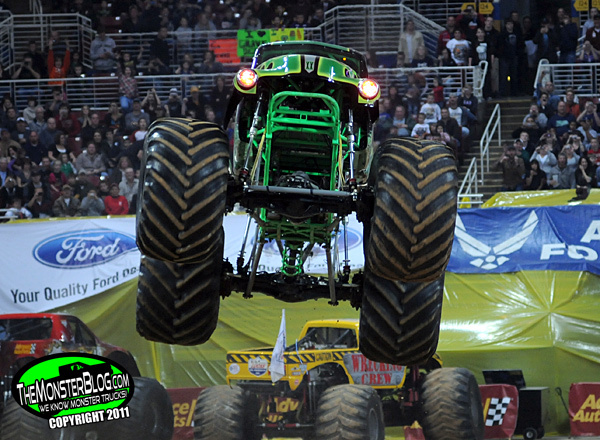 Grave Digger has entertained millions of fans worldwide and has hundreds of racing and freestyle wins – including four Monster Jam World Finals℠ championships. 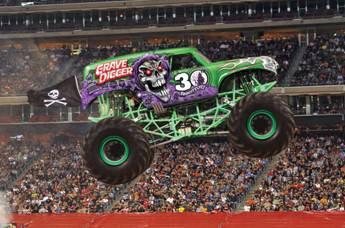 The black and green 30th Anniversary Grave Digger paint scheme. 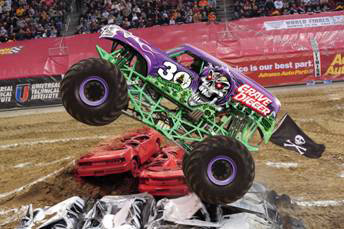 Highlighting the Grave Digger 30th Anniversary celebration, which starts in January, will be three specially designed Grave Digger monster trucks, a traveling fan experience, limited edition merchandise, and interactive promotions. 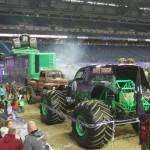 Monster Jam fans can get up close to the newly designed versions of Grave Digger and participate in the traveling Grave Digger 30th Anniversary Experience, as part of the Monster Jam pre-show Party in the Pits. The Grave Digger 30th Anniversary Experience, which will tour to all Monster Jam events in which Grave Digger will be performing, features a historical timeline from Grave Digger’s humble beginning to its rise in popularity, exclusive vintage attractions, limited edition merchandise like the Grave Digger 30th Anniversary DVD, broadcasts of thrilling moments from Monster Jam events spanning three decades, and more! Also part of the celebration is a full line of exclusive limited edition Grave Digger 30th Anniversary merchandise available at mass retail outlets where Monster Jam products are sold. 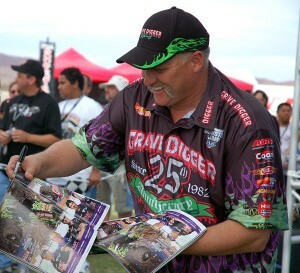 The purple Grave Digger 30th Anniversary paint scheme. Monster Jam partners like K’NEX construction toys also are paying homage to Grave Digger’s 30th anniversary by completing a massive top-secret project with a group of talented builders at Royal British Legion Industries (RBLI) based in the United Kingdom. The project dubbed BIG BUILD will be revealed in early 2012. BIG BUILD took the team at RBLI more than 300 hours over the course of three months to construct by hand and used more than 700,000 K’NEX pieces. This week the BIG BUILD began its trans-Atlantic pilgrimage from RBLI headquarters in Kent, on England’s southeastern coast, to the United States in preparation for its official unveiling at the beginning of January. The green 30th Anniversary Grave Digger paint scheme. No stone has been left unturned for fans to join in the celebration and all of the fun and excitement of the 30-year history of Grave Digger. 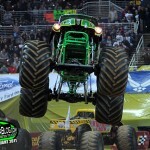 Monster Jam fans can get their first sneak peak of the Grave Digger 30th Anniversary celebration on December 24th with the Monster Jam television special airing on CBS, which will provide highlights of 2011 Advance Auto Parts Monster Jam season along with exclusive Grave Digger 30th Anniversary features. 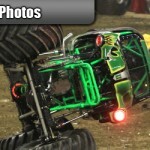 Interactive promotions for Grave Digger fans also can be found on MonsterJam.com and Monster Jam’s Facebook Fan page. 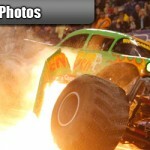 Tickets are available today at www.MonsterJam.com. 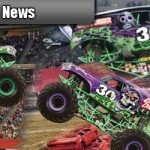 Stay tuned for upcoming Grave Digger 30th Anniversary announcements at www.facebook.com/mjonline, and www.twitter.com/monsterjam. Feld Motor Sports®, Inc. is the world leader in specialized arena and stadium-based motor sports entertainment. Feld Motor Sports, Inc. productions include Advance Auto Parts Monster Jam®, Monster Energy Supercross, AMA Arenacross Series, Nuclear Cowboyz®, and IHRA® Nitro Jam®. 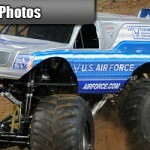 Feld Motor Sports, Inc. is a division of Feld Entertainment, the world’s largest producer of live family entertainment. For more information on Feld Entertainment, visit www.feldentertainment.com. Founded in 1992, K’NEX Brands, the world’s most innovative construction toy company, was established to make and sell what has become one of the world’s leading integrated construction systems for children. Winner of over 200 international awards and recognitions, K’NEX is America’s building toy company focused on Building Worlds Kids Love, and encourages youngsters to “imagine, build and play.” Since 1992, The Rodon Group, a subsidiary of K’NEX Brands, L.P., has manufactured over 30 billion parts for the K’NEX building toy system. For more information, please visit www.knex.com or www.rodongroup.com. (New York, New York – History Channel PR) – Robert “Boston Rob” Mariano (Survivor, The Amazing Race) and Dennis Anderson (creator of the monster truck Grave Digger) will host the upcoming new series “Around the World In 80 Ways”, it was announced today by Dirk Hoogstra, Senior Vice President of Development and Programming for HISTORY. In HISTORY’s 10-part series slated to premiere later this year, they will take on an epic challenge: to circumnavigate the globe using 80 different modes of travel without repeating any vehicle. 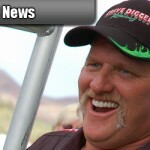 Legendary monster truck driver Dennis Anderson is set to star in the upcoming History Channel reality series "Around the World In 80 Ways". Rob and Dennis will have to employ every conceivable means of transportation – blimp and fighter jet, ostrich and canoe, chariot and hitchhiking – and will even have to build their own vehicles. Sometimes they will work together and other times they’ll race. But the hosts are notorious for their vicious competitive streaks and have been known to cheat, torment, boast and battle their way to the top. In this extreme expedition, nothing is off limits. “Boston Rob” Mariano made his first television appearance on Survivor: Marquesas in 2002. Mariano is a four-time Survivor contestant and a two-time competitor, along with his wife Amber Brkich, on The Amazing Race. He has hosted several television events and shows and starred in a regular segment for the CBS Early Show. An avid sportsman, Mariano is Boston-born and holds a bachelor’s degree in psychology from Boston University. 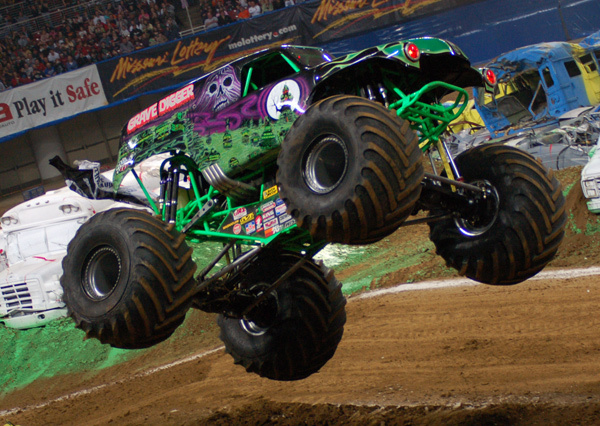 Four-time Monster Jam world champion Dennis Anderson is the creator and driver of Grave Digger, the world’s most recognized monster truck brand in the history of the sport. 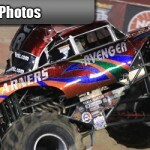 Anderson has won more than 3,000 races and 500 trophies over a three decade career and has appeared on numerous television series such as America’s Toughest Jobs, Conan O’Brien and Monster Jam. Anderson also continues to expand the Grave Digger brand through his Muddy Motor Sports Park and restaurant outside Kill Devil Hills, NC. AROUND THE WORLD IN 80 WAYS is produced for HISTORY by Original Productions, a FremantleMedia Company. Thom Beers and Philip D. Segal are Executive Producers and Jeff Conroy is Co-Executive Producer for Original Productions. Julian P. Hobbs is Executive Producer for HISTORY. HISTORY(R) and HISTORY HD(R) are the leading destinations for revealing, award-winning original non-fiction series and event specials that connect history with viewers in an informative, immersive and entertaining manner across multiple platforms. Programming covers a diverse variety of historical genres ranging from military history to contemporary history, technology to natural history, as well as science, archaeology and pop culture. Among the network’s program offerings are hit series such as American Pickers, Ax Men, Brad Meltzer’s Decoded, Ice Road Truckers, Top Gear, Pawn Stars and Top Shot, as well as acclaimed specials including America the Story of Us, WWII in HD, 102 Minutes That Changed America, The President’s Book of Secrets and Life After People. HISTORY has earned four Peabody Awards, seven Primetime Emmy(R) Awards, 12 News & Documentary Emmy(R) Awards and received the prestigious Governor’s Award from the Academy of Television Arts & Sciences for the network’s Save Our History(R) campaign dedicated to historic preservation and history education. Take a Veteran to School Day is the network’s signature initiative connecting America’s schools and communities with veterans from all wars. The HISTORY website, located at www.history.com, is the leading online resource for all things history, featuring over 20,000 videos, images, audio clips, articles and interactive features that allow visitors to dig deeper into a broad range of thousands of historical topics. 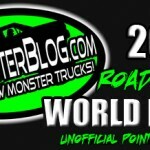 One of our most popular features each year on TheMonsterBlog.com is back for 2011, as we once again rank drivers week to week in our “Road to the World Finals” Unofficial Point Standings. 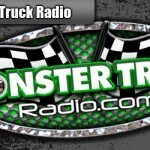 Fans always wonder exactly how USHRA selects its 24 competitors for the annual Monster Jam World Finals, and so do we. We also often wonder just how all the drivers stack up against each other throughout, and at the end of the year. Without a national points system for the Monster Jam series, it is awfully hard to do so as they often run events in up to 10-15 different venues in a single weekend. 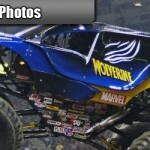 So for the 5th year in a row, TMB will be operating our “Road to the World Finals” unofficial point standings for the Monster Jam series based straight from results available at MonsterJam.com. This is our way of ranking the drivers based on their performance throughout the season and gives us a good idea of which drivers have earned a spot in the World Finals, whether they ultimately end up being selected or not. If you didn’t follow along last year, we’re sure that you have many questions about how we put this together: How does it work? Which events are we including? How are the points awarded? etc. At the bottom of each week’s update, you’ll see the detailed rationale and explanation that should answer most of these questions. Last year, Tom Meents edged out Dennis Anderson in one of the closest point battles we’ve ever seen, eclipsing Dennis by less than 5 points. Who will be tops in 2011? Follow along and let’s find out together! So far in the 2011 season, the battle for the #1 spot is shaping up to once again be the Dennis and Tom show, with Anderson having the edge after Week 1. Anderson’s huge double down in Houston has him out front over Meents, who picked up a freestyle win in Detroit but was eliminated in the semi-finals of racing. Big performances from Gary Porter and Carl Van Horn in Columbus and Trenton, each winning 5 of a possible 6 competitions has them in the mix as well, tied for third overall with Linsey Weenk in the new Lucas Oil Crusader stemming from his strong performance in Houston. 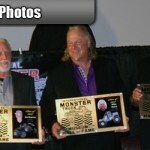 The legendary Dennis Anderson has the #1 spot after a Double Down performance in Houston. The battle for the last spot has yet to take shape after only one week of competition as thirteen drivers are currently tied for the 21st overall position. Once a couple weeks of the season are in the books, we’ll have a better picture of who is earning a shot at the World Finals in 2011. For results from Normal Level events, check out the 2011 Results Tracker January 7th-9th Weekend Results page (drivers earn 5 points for a racing or freestyle win). 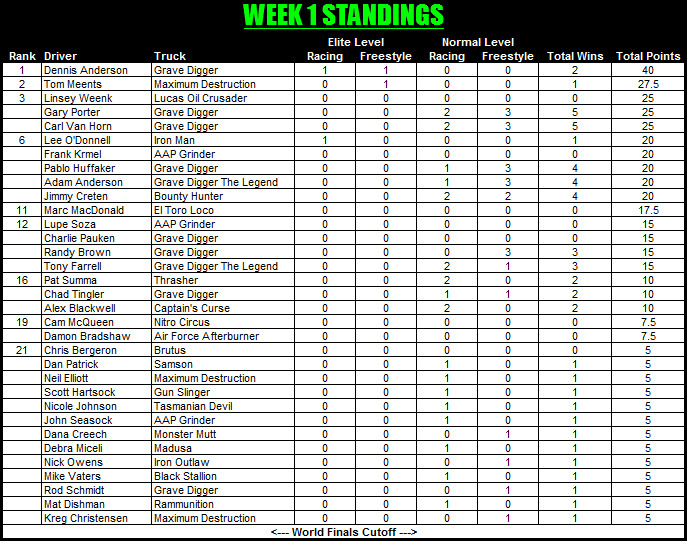 Keep following TMB’s “Road to the World Finals” for all the results and current standings each week. Keep in mind this is all unofficial and is just for fun and enjoy as we track the Monster Jam series all the way to the World Finals in March! For some time, fans across the country have wondered why the USHRA does not run a public points system of some kind for their Monster Jam series. We are included in the group that would love to be able to follow the standings of such a series each week. We are of the belief that a berth in the Monster Jam World Finals should be earned based on performance throughout the year in both racing and freestyle. Regardless of what portion of the monster truck industry you favor, there is no denying that the Monster Jam World Finals is the biggest and highest profile event our sport has to offer. A chance to compete at this event is a big deal for many drivers out there, and it is our opinion that they should be able to earn their way in. We’re not saying that Feld Motorsports doesn’t pick the World Finalists based on performance currently–we’re simply saying that we don’t know how they make up the field because the process isn’t made public. So with that in mind, we have created an UNOFFICIAL points system that is simple (although it may seem complicated) and that rewards performance in all Monster Jam events across the country leading up to the World Finals. In our Standings, we will show the cut-off after the 24th truck, indicating that IF entry to the World Finals was based SOLELY on performance, these are the drivers that would be headed to Las Vegas. Keep in mind that this is just for fun and has no actual bearing on the selection of World Finals participants. See below for a breakdown of our points system and our rationale for the decisions we made in creating it. What is an Elite Level event? 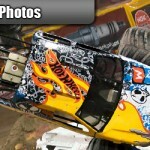 We define an Elite Monster Jam event as any with a field of 12 of more trucks. 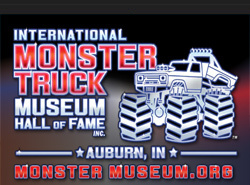 We have chosen to award these events the highest amount of points, because these are the highest profile Monster Jam events. These events are the ones held in the major stadiums in front of the biggest crowds, some of which are even televised on SPEED. It is our belief that performance in the highest profile shows should be weighted most heavily toward a World Finals berth because these events are most similar to the World Finals itself. The most points any one driver can score in an Elite Level event (and thus in any event) is 40. If an event meeting all of this criteria holds 3 or more shows over the course of a single weekend, the points for each show are worth half of what is listed below. What is a Normal Level show? 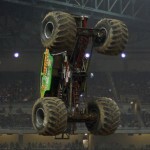 The majority of Monster Jam events held around the country are Normal Level shows. These events are typically held in smaller arenas around the country, consisting of multiple shows held over the course of the weekend (anywhere from 2-5), with fields of anywhere from 5-8 trucks. Looking at the points awarded for these shows, you will notice they are much less than the upper levels. We equate the significance level of an entire 4 show weekend of Normal Level events with the significance of one Elite Level show–thus, the maximum points a driver can earn in a weekend at a Normal Level event is 40 (this based on the usual maximum # of shows being 4 (Tacoma being the exception with 5), and an available 10 points per show (10×4=40)).